We women keep on buying some gadget or the other for using in our kitchens. Well I makes our lives easy and reduces our time and energy spent on cooking. Here is a small one I bought. Its a grater. It is also known as a shredder. Well I have other big ones but could not resist this. This can be used for grating, cheese, butter, garlic, ginger, carrots, cabbage etc as well as dry coconut. The shreds are very fine, so I use it more for grating ginger and garlic as I don't have to grind them to a paste when the quantity used is very little and also when I don't have much time. 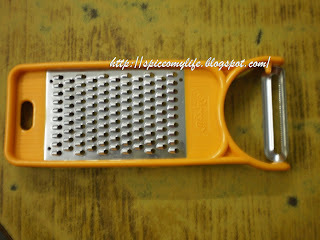 I also use it for grating carrots, radish, dry coconut for garnishing. It has a peeler on one end. I feel it is a handy tool and much cheaper. What do you say.